So the tyre repair held up nicely and the Connie got into the shop for her new shoes - the 10th pair I've put on her and the 6th pair of PR2's! Yes, she likes to eat her way through the rubber and I'm still very happy with the 2's. As mentioned in my last blog, I came home from the Moto-X on Sunday to discover that the poor Connie was sitting on a flat tyre. Tonight it was time to take a look at it and decide how I was going to get the bike or the wheel into the bike shop for some new rubber that is sitting there waiting for me. I decided that I would see how bad the leak/puncture was by blowing the tyre up. Then I could decide whether to just wait and pump the tyre up before I took into the shop or learn how to remove the rear (I still haven't done this in 6 years of ownership). Ideally I wanted to get the bike into the shop as both tyres need replacing and I didn't really want to have to make two trips to get the job done. In the end I actually had to put some air into the tyre before I could move the bike and get it on the main stand. Then I could start looking and listening for the leak. With a bit of air in the tyre I spun it around and immediately spotted the culprit. If you look closely you may see a little shiny something inside the hole. I still don't know what it was (perhaps a nail, maybe a stone) as I could not pull it out and it ended up inside the tyre. So, I decided that I would try and fix the puncture rather than either of my two previous plans - at least it would be good practice in case I was unlucky enough to get another puncture out on the road. After first running the awl through the hole (to make it easier to get the plug in) it was time to push the plug in. This was pretty tricky as the tyre had gone flat again so I poked it in a little and then pumped more air into the tyre. It was then easier to get the plug right through the tyre. A quick twist and then I removed the insertion tool. Followed by a little trim of the excess sticking out. Then it was time to see how well the plug was sealing. I pumped the tyre up and grabbed some soapy water to check for leaks. Today was the Woodville Moto-X GP and with a free ticket in my pocket I really thought that I should go and make an appearance. I rode over on the mighty Vee as it's the closest thing I've got to an MX bike but resisted the urge to enter any of the races and went to find a decent vantage point. I'd arrived just as the last of the practice/qualifying sessions were ending and settled in to see if I could get any decent piccys. I'm not that up with the MX scene but obviously anything with a motor and a couple of wheels is worth watching. The sounds of both two and four stroke singles getting their necks wrung as the dirt flies out off the back tyres is also a great experience. Soon it was time for the big boys and man those MX1 bikes make everything else look slow! Big four strokes yelling their heads off - outstanding! When the MX2 boys came out there was once again a big field and this meant one thing - more carnage at turn one! These guys were not that much slower than the MX1 guys either. Great racing. After a few more races it was time for one of the crowd favourites - the first of 2 river races where the course takes riders in and out of the river. This is a great way to clean the dust off I 'spose but ya strides end up getting a bit wet. An electric start is also quite handy. My olds are currently homeless after selling their house and taking to their bus. They are currently tiki-touring around the place and today they were in Otaki which is only about 70km from me so I thought I'd pop down to see them. 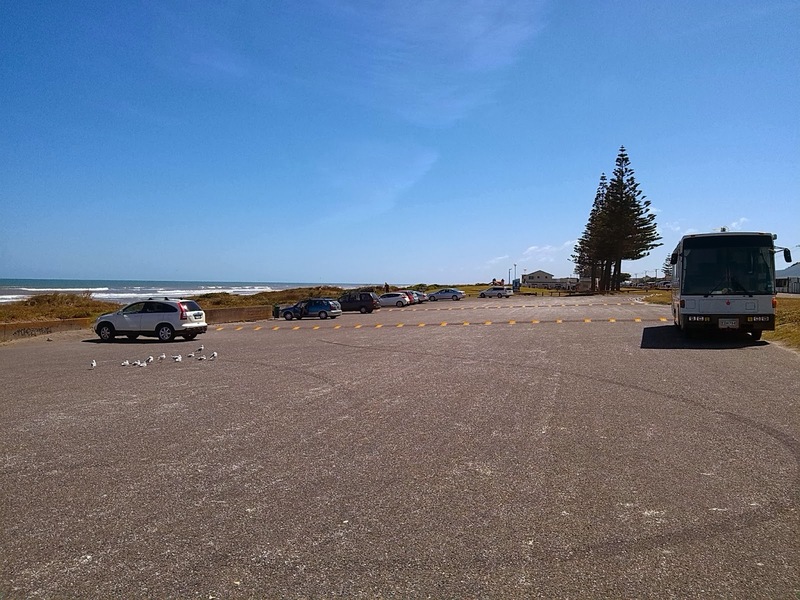 The trip down to Otaki was on main roads and in pretty heavy traffic at times so didn't really rate as a lot of fun but on rolling up at Otaki beach there was lunch to be had so that kinda made up for it. 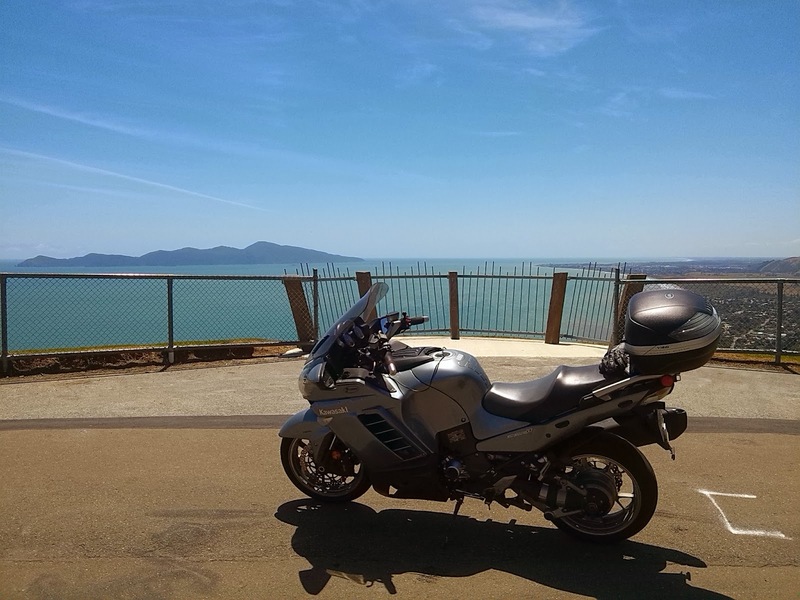 With the day being so nice I was hardly going just turn around and head home so I decided a trip over the hill into the Wairarapa was on the cards. I little more of the dreaded SH1 was sucked up before I turned off up Paicok hill - a great ride with some good views from the top. On the way over the Haywards I was stopped briefly at an incident. I'm not sure if there had been a car accident or what but a car was ablaze on the side of the road and the fire service were sorting it out as I rolled up. Unfortunately I only had my phone with me to take pics so the below is the best I could do. There had been a lot more smoke prior to me being able to get the phone out. I also failed to get a picture of the little dog riding in a tank-bag on the bike at the right of the pic. From Masterton I decided to head up Route 52 to Alfredton and then onto Pahiatua and check out the stories of earthquake damage to the road on SH52. There wasn't too much on the bit of 52 I did but there was evidence of slips and some slumps in the road on Pa Valley Road and Mangaone Road on my way back into Pahiatua. 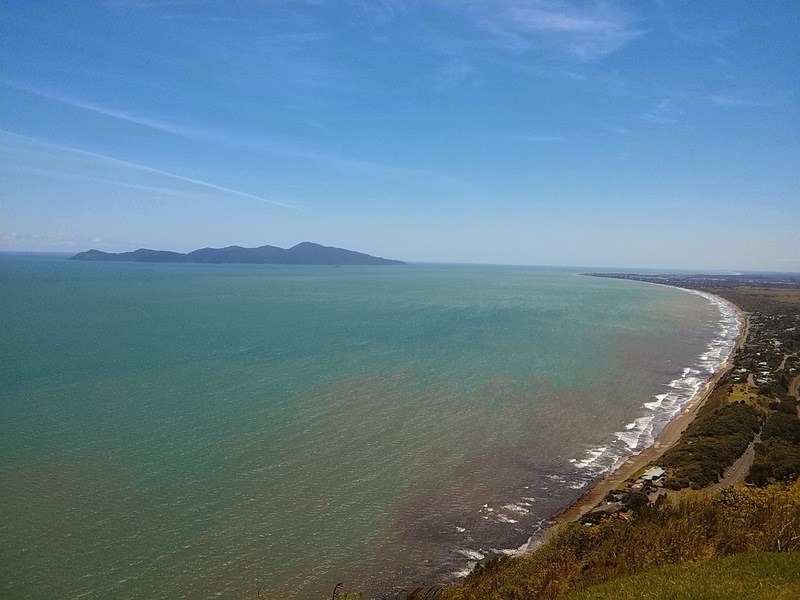 Yesterday was the first BRR ride of the year and not only had Neil come up with a good route but he had also managed to arrange a cracker of a day. Our gang met up in Feilding and after a coffee and bull session it was time to go looking for gravel. 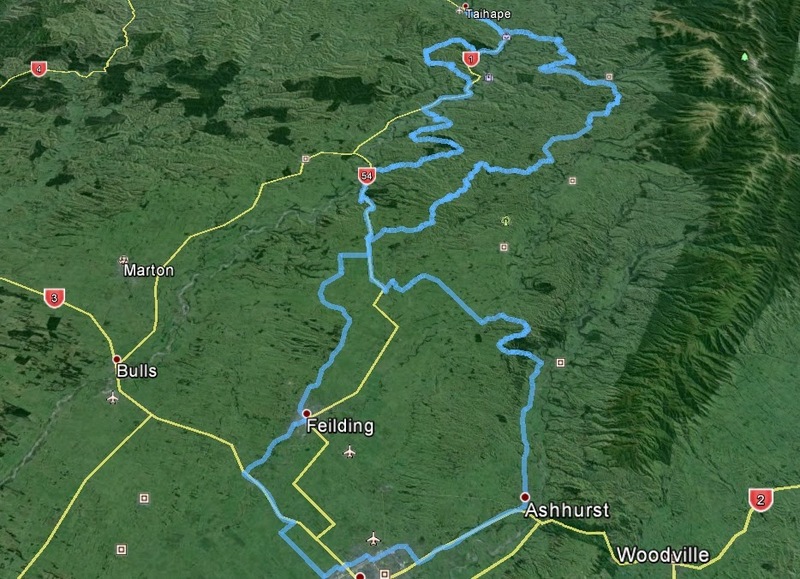 Neil led us out of Feilding to Waituna West via some back roads ashphalt. Turning off onto Waituna Tapuae Road it wasn't too long before we hit our first bit gravel and discovered how dusty the day was going to be. Get a load of those blue skies! 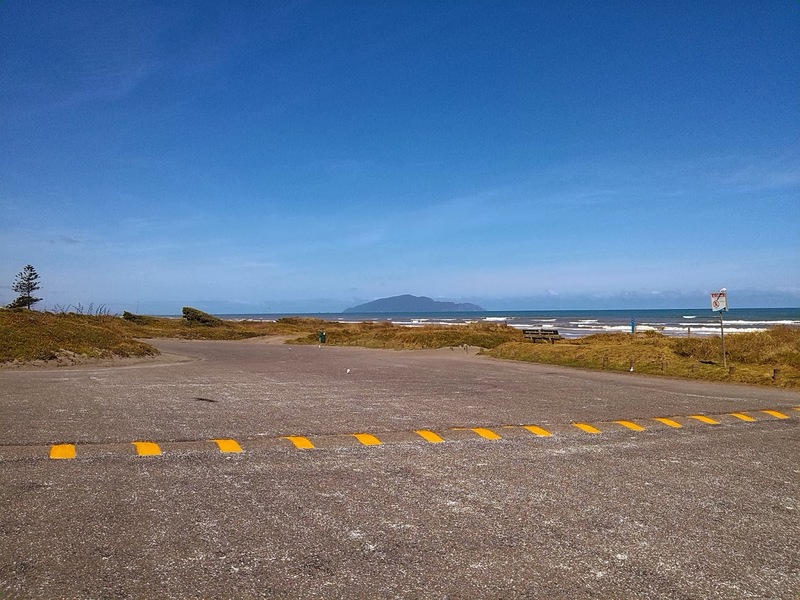 Waituna Tapuae Road eventually ends where a left will take you down Upper Pakihikura Road or a right leads off down Peep O'Day Road. This is a really neat bit of road and this was the first time I'd ridden it in this direction. Some of the tight stuff was pretty slow going on the DL but there was also this great bit of uphill at the end. A longer edit of Peep O'Day Road can be found here. 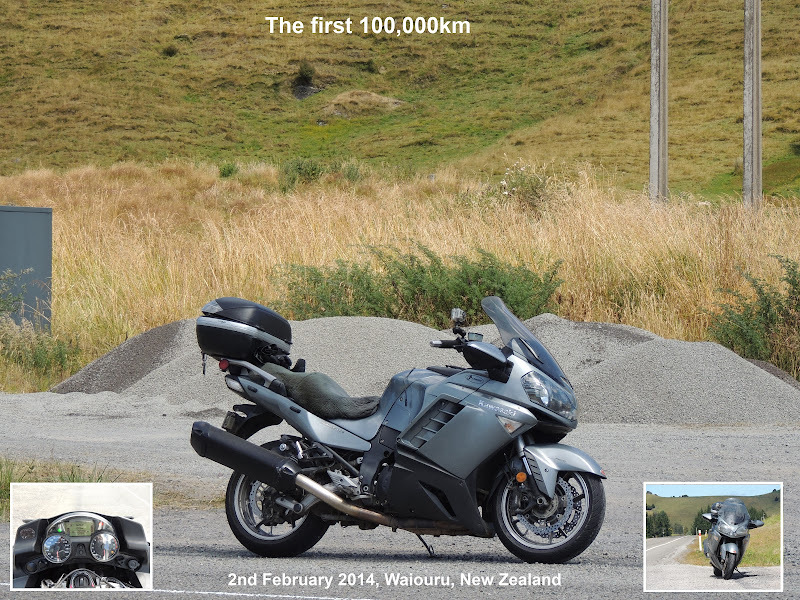 A short stretch of tarmac led us into Rangiwahia where we stopped for a bit of a breather. As we were preparing to leave Rangi I got a nice surprise when Colin offerred me a spin on his 660 Tenere. Prior to the ride we'd been chatting about it now I got the chance to have a spin on it - awesome! Eventually we found our way back out onto SH1 and into Taihape for lunch - it had been hot work so a break and a cold drink was pretty welcome. After lunch Neil had two little loops either side of SH1 planned for us. 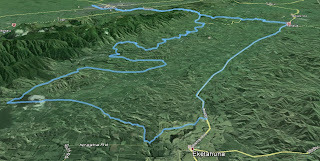 The first was Manui and Te Kapua Roads. More great gravel and a good excuse to use up the last of my GoPro's battery. Just North of Ohingaiti and made for the gravel of Mangamako Road. More dust and a cow on the road got us through Lower Pakihikura Road and out onto Vinegar Hill. 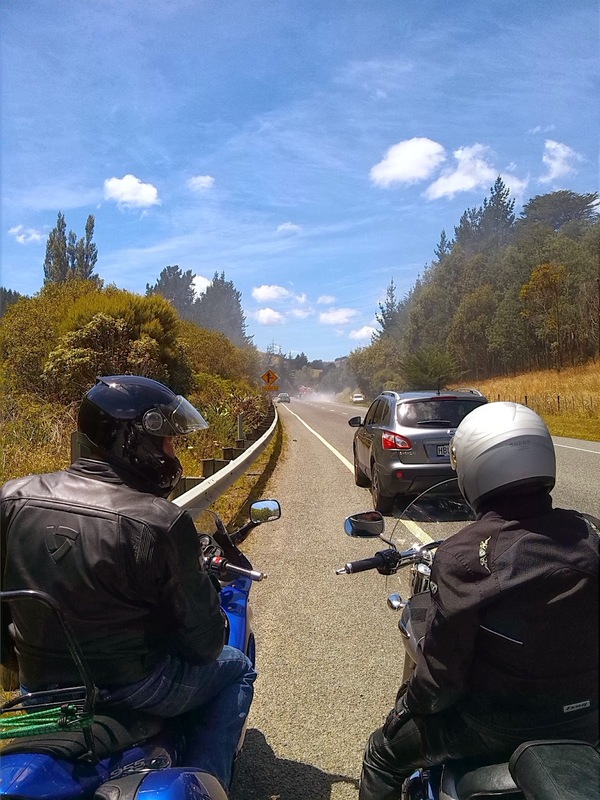 Here some of the guys headed to Hunterville for coffee while I decided to tackle the hill (looking out for the hot tar) and make my way home. I had initially planned to go straight home but when I got near Beaconsfield I decided that I hadn't quite had enough of the dust and turned of to make may way across to Pohangina via Levett Line, Coulters Line, Ridge Road (yes, that Ridge Road) and Finnis Road. From there it was just a quiet cruise on tar back home via Ashhurst. Awesome day out! Yesterday it was time to show the DL a bit of love - I know, you're not supposed to but just every now and again ok? Love in this case was represented by a new air filter. 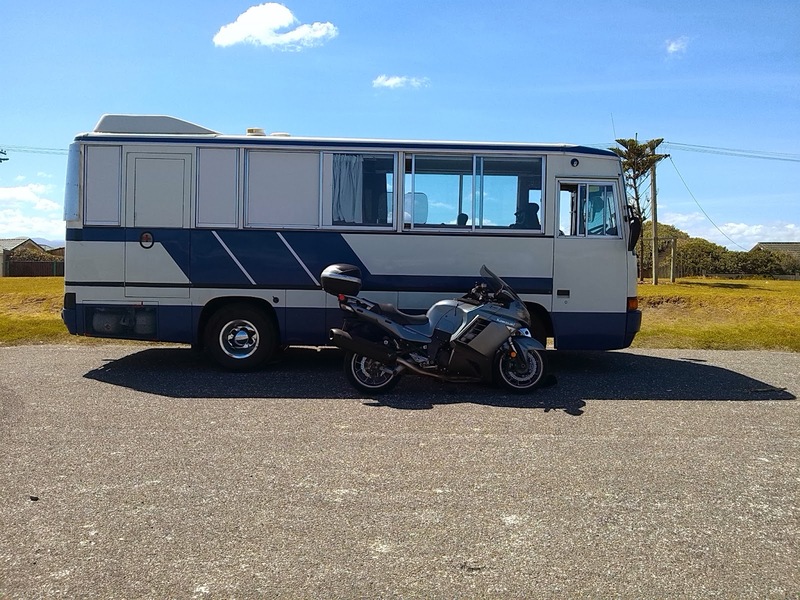 I guessed that she was probably still running her original one and figured with her favourite diet of dusty gravel roads being reasonably regular, it was probably time to spoil her. First of all I had to take off some of her clothes (this how-to was helpful although I had done this before) and the air-box was soon uncovered. The trickiest bit is the fuel fitting under the tank but it is the same type as on the Connie so I managed to work it out ok with a bit of muttering and holding my tongue just right. Jeebus! The dust gets in everywhere! All that remained to do was to button everything up and put the clothes back on again. She even fired up once the go-juice was reconnected! But the fun didn't stop there! 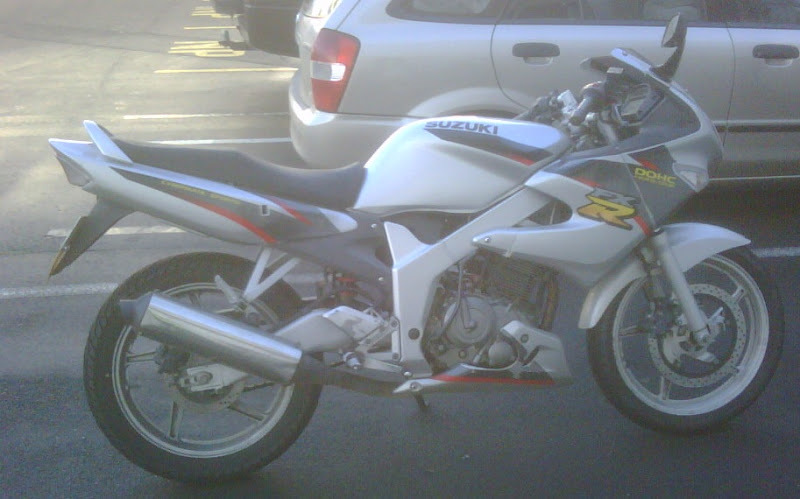 Today Mark brought around his bike and we not only did the air filter but also the plugs and the oil and oil filter too. Shed fun is nearly as good as riding fun. More Google+ interfering...I have no idea why my map needed snow. It needed wind and rain! We had a lot of rain last night and the morning didn't really start out a lot better with showers on and off all morning but I'd already decided that it would be good to get out on the Vee and find some gravel - gravel is always nice to ride on after rain. So, just before 12 I set off with a bit of a plan floating around in the empty space between my ears and headed for the track to take me across the other side of the hill. I was pleasantly surprised with how well the tyres handled the very wet and slippery roads - they only gave me grief on road markings or on really tight corners when I changed down to 2nd gear and ended up a bit sideways. 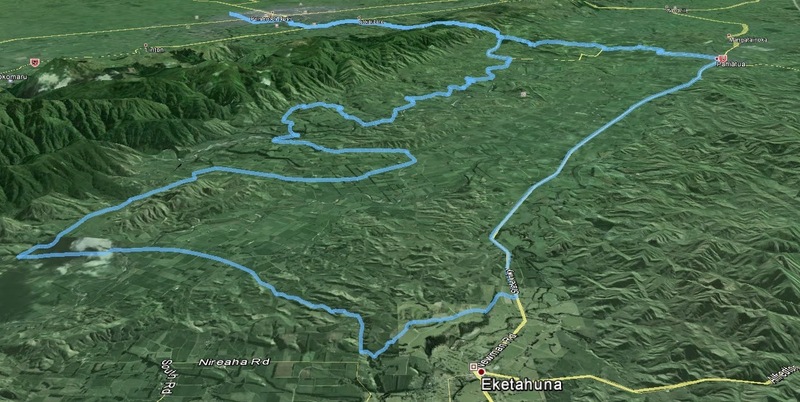 Part one of my route was to take me to Eketahuna via the same roads I rode on my way back from Castle Point last November except I'd be going in the reverse direction. Further on up the road from here the road straightens a bit and it's great fun being able to open up the DL and use the top couple of gears while on a good gravel surface. This wasn't to be today though as the weather changed to "shocking" and I couldn't go higher than 4th as the wind was threatening to blow me out of the nice wheel tracks and into deep and nasty gravel. As soon as I hit SH2 I turned and made the dash up to Pahiatua. During this tarmac leg the weather went from shocking to whatever happens to be next on the scale of crappiness and I had to battle very strong crosswinds and more pouring rain. I ended up having to pass a few slower cars so I could go faster and smash a bigger hole through the wind all the time trying to avoid the standing water across the roads in some places. I stopped in at Pahiatua for fuel where the guy taking my money made some sort of comment along the lines of "great day for it" - perhaps he's an out of work comedian? Anyway, after our stimulating discussion I pulled on my wet gloves and disappeared back out into it. It was good to finally get home around 2pm, get my wet gear off and finally rustle up a late lunch. Not the nicest riding conditions but I still enjoyed the ride - particularly the gravel sections which were a lot of fun.